What is the Tracker Database Password? How Do I Restore Attachments? Why Did CopyStorm/Restore Skip a Record? How Do I Restore Deleted Records? How Do I Restore Autonumbers (i.e. Case Number)? How Can I do a Complete Restore? Why Are the LastModifiedBy and LastModifiedDate Fields Wrong? The Meta Data tab enables the restoration of Salesforce metadata with surgical precision. 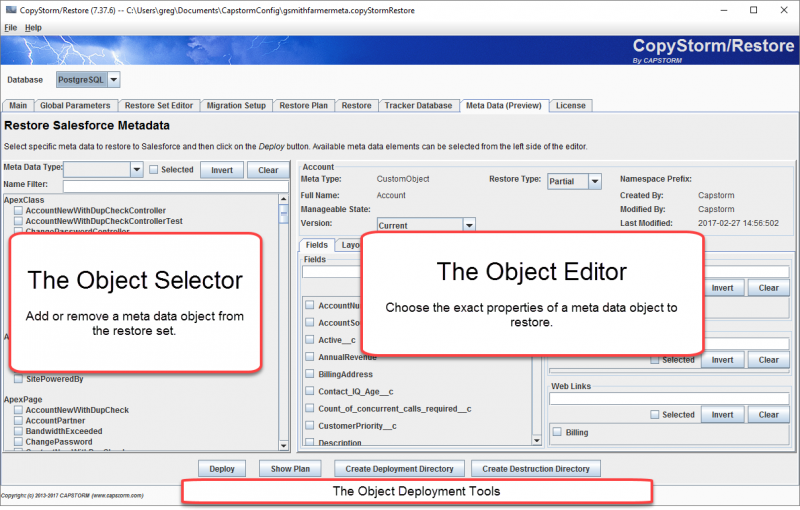 The Object Selector — add or remove a metadata object from the deployment set. The Object Editor — precisely select the properties of a metadata object that should be deployed. The Object Deployment Tools — deploy the selected metadata. To add a metadata object to the deployment set, click on the checkbox next to its name. Default behavior will be to load the object into the Object Editor. To remove a metadata object from the deployment set, uncheck the box next to its name. Meta Data Type — if selected, only metadata objects of the given type are displayed. If blank, all metadata types are shown. Selected — if checked, only metadata object that are part of the deployment set will be shown. Invert — when clicked, unchecks any checked items and checks all unchecked items. Clear — when clicked, unchecks all visible checked items. Name Filter — as characters are typed into this box, only metadata objects containing the typed text will be displayed. The version of the metadata object which will be deployed. The sub-components of the metadata object which will be deployed. Simple — the only available option is the version which will be deployed. Examples include ApexPage, ApexClass, and PermissionSet. Complex — there are multiple sub-components that can be selected individually. Deploy — deploys the selected metadata to Salesforce. Show Plan — displays a summary of metadata in the deployment plan. Create Deployment Directory — create a directory structure usable by the Salesforce Migration Tool to deploy the selected metadata. Create Destruction Directory — create a directory structure usable by the Salesforce Migration Tool to delete the selected metadata.